Even before Leonardo Di Caprio made Maya Bay famous with his movie 'The Beach', Maya Bay was world class. As you round the cliff walls from the open sea at the mouth Maya Bay you cannot help be struck with the sense of awe, the perfection and majesty. 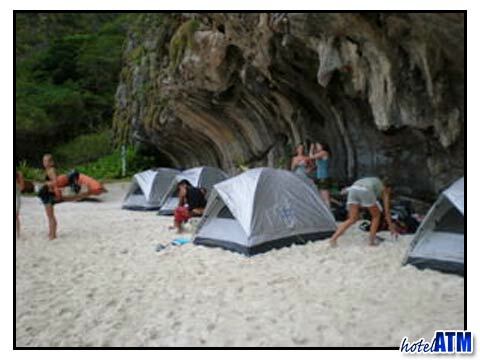 Maya Bay Camping has the sole rights to run daily camping tours to Phi Phi Ley and this is done under the auspices of the Phi Phi Island National Parks. This ensures that the maximum numbers to the Bay are controlled and the taking refuse away after it is used can be policed. The island is 90% cliff and mountain and so while the village has grown up as one of the best holiday destinations in Thailand, the views and landscapes that first greeted the early backpackers remains much the same . The towering cliffs of the main Tonsai Bay still soar above the hotel near the pier, the view point still defines the main view of the village as 2 beaches in the shape of a dumb bell. The day starts at 4pm at the Lemongrass Restaurant near the main pier on Phi Phi Don and departs for Phi Phi Ley island shortly after (this is of course, weather and customer demand permitting). The Maya Bay Camping vessel is a cool wooden converted fishing trawler. It takes 20 minutes to get out to Phi Phi ley and the first stop is at the Viking Cave and then on another 200 meters to the mouth of Pi Ley in let. Here the campers get to snorkel and kayak off the reef. Pi Ley is an fjord like inlet that goes 350 meters into the heart of the island ending up in a deep pool where you can swim. Here fruit is served on board. After this stop the camping tour heads further south to Loh Samah where there is some of the finest snorkeling on Phi Phi Ley Island. Finally by around 5pm the boat arrives at 'The Beach' a time that marks the end of the day for most of the sight seers and tourists. There you are on Maya Bay alone. Maya Bay Camping tour sets up a central entertaining area with lamps, guitars and IPOD speakers. The guests divide their time with swimming exploring and hanging out. The tour serves dinner around 8 pm, and most nights it is a delicious Thai chicken curry with vegetables and steamed. A late supper of BBQ chicken or fresh fish is served around 11 pm for those who are still hungry. A simple bar selling beers carries on till late and the prices are very reasonable at 80 THB a beer and 250 Baht a for the whiskey Buckets. For those who prefer to get close to nature without the noise, Maya Bay beach is very long and there are plenty of places to hang out in solitude and the quiet. Swimming at night time, the full moon and or starry night are highly memorable, the phosphorescence in the sea a personal favorite (phosphorescence appear in the sea as tiny showers of light when the water is disturbed). If you have the energy, the sunrise can be seen from the hole near Loh Samah bay but for most, the filling breakfast of eggs, toast, butter jam, coffee and tea, served around 8am is great way to start the day. The Maya Bay Camping boat takes you back to the Phi Phi Don island around 9:30 am arriving around 10 am. The tours run with a minimum of 6 people and on average have about 20 people. In season these tours are highly popular. Price 1,900 baht per person as of 16 October 2008. 1 night accommodation, 3 meals, 1 free bucket, National Park entry fee, Snorkelling and Kayaking. The trip is run by two Phi Phi locals and one Australian expat, Phil. Customers cannot bring their own drinks. National Park and company rule. There are 6 flush toilets on the island. A few mosquitoes at dusk and dawn, but any slight sea breeze will keep them away. Spare clothes, towel, camera, insect repellent and money for alcohol. Your travel bags can be kept at Lemongrass restaurant on Phi Phi Don Island.